2101 S Soncy Rd., Amarillo, TX 79124 Disclosure: Prices are subject to change when order is placed with the store or restaurant. 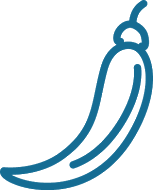 Prices of delivery items are different from carry out prices. Your choice of filling and sauce. Served with garnish salad and 2 sides. 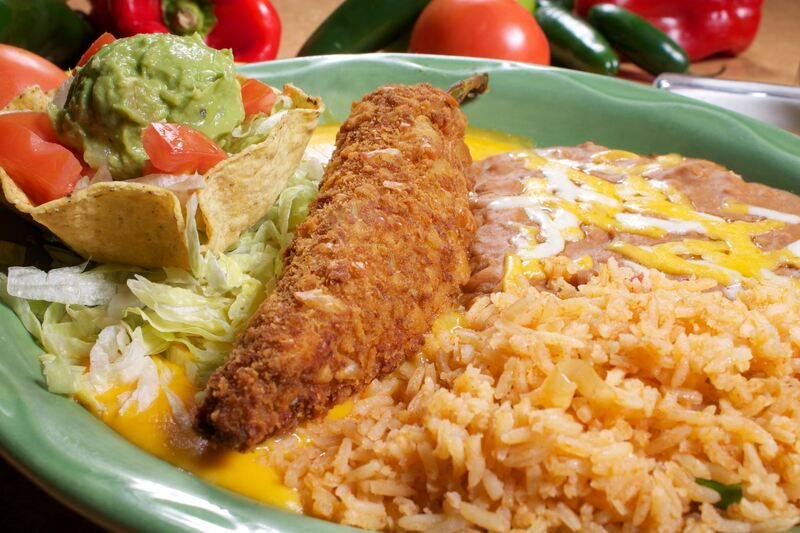 Our famous crispy relleno, with your choice of enchilada & a guacamole salad. Choose your Filling and Pick your sauce. Our famous crispy beef relleno, cheese enchilada and a pork tamale topped with red sauce. Served with a beef taco on the side. Hand-breaded and deep fried with beef or chicken fajita meat on a bed on sauce of your choice. Served with a garnish salad and your choice of two sides. Eight mozzarella cheese sticks coated in a spicy batter and deep fried. Service with ranch dressing and our homemade red pepper jam. Eight battered jalapenos stuffed with cream cheese & deep fried until golden brown. Served with our homemade red pepper jam and ranch dressing. Our unique fried mushrooms. Slices of portobello mushrooms hand battered & fried to perfection. Served with ranch dressing. Chicken fajita quesadillas, bean & cheese nachos, chicken taquitos, fried mushrooms, jalapeno poppers & cheese sticks served with guacamole, chile con queso and ranch. No substitutions. Crispy tostadas prepared daily, seasoned ground beef or shredded chicken, beans, melted cheddar and monterey jack cheese topped with lettuce, tomatoes, sour cream, guacamole, and a side of jalapenos. Crispy tostadas prepared daily, seasoned ground beef or shredded chicken, beans, cheddar and monterey jack cheese and a side of jalapenos. Charbroiled beef or chicken fajita meat, with beans, melted monterey jack and cheddar cheese with a side of sour cream and jalapeno slices. Crispy tostadas prepared daily with refried beans, melted cheese and a side of jalapenos. Served With Any Dressing Of Your Choice. Fresh greens tossed with your choice of beef or chicken fajita meat, cheese, tomatoes, avocado, fresh strawberries and sliced almonds. A grilled Norwegian salmon cooked to perfection on top of fresh greens, cheese, tomatoes, avocado, strawberries, sliced almonds and our homemade mango salsa. Chicken breast marinated in teriyaki seasoning served on top of a bed of shredded lettuce, tomatoes, cheese, fresh slice of avocado, boiled egg slices and crispy croutons. Tender charbroiled chicken breast pieces on top of crisp shredded lettuce with avocado slices, cheese and tomato served in a crisp crowned 12" flour tortilla. Hand breaded crispy chicken breast strips on top of fresh lettuce, tomato, cheese, almonds, onions, and slices of avocado. Seasoned ground beef or shredded chicken on a bed of lettuce and tomatoes topped with chile con queso and served in a crisp crowned 12" flour tortilla. A crisp tortilla shell layered with beans, your choice of beef or chicken taco meat, lettuce, tomato, sour cream and guacamole. Fresh pita bread stuffed with grilled chicken strips, bell peppers & onions topped with melted cheese, served with a cup of tortilla soup and garnish salad. Chicken vegetable soup served with a garnish salad, sliced avocados & pico de gallo on the side. Spiral pasta topped with our chicken fajita meat, grilled zucchini, squash & corn smothered in your choice of sour cream sauce, cream sauce or queso sauce with melted cheese & Texas Toast. Two cheese enchiladas with the sauce of your choice on top of grilled onions and bell peppers topped with beef fajita, chicken fajita or shrimp. Served with a guacamole salad and your choice of two sides. Chicken enchiladas topped with our homemade tomato sauce and queso fresco, drizzled with Mexican sour cream. Served with an avocado salad and your choice of two sides. Enchiladas filled with beef or chicken fajita meat, topped with any sauce of your choice and served with a guacamole salad and your choice of two sides. Veggie enchiladas filled with grilled squash, zucchini, spinach topped with our homemade shrimp cream sauce. Served with white rice, charro beans and a small garnish salad. Shrimp enchiladas topped with our homemade cream sauce, two grilled jumbo shrimp and served with a garnish salad and choice of two sides. Three stacked enchiladas layered with your choice of meat, smothered with any of our homemade sauces and topped with two eggs. Served with your choice of two sides. Fresh flour tortilla with melted cheese and chicken or beef fajita meat. Served with sour cream & guacamole. A large crisp toasted flour tortilla stuffed with shrimp, cheese, tomatoes & green onions, served with sour cream and guacamole. A large crisp toasted flour tortilla with melted cheese & seasoned ground beef or shredded chicken. Served with sour cream & guacamole. Flour tortillas stuffed with chicken fajita meat & cheese. Deep fried until golden brown & served with beans, guacamole, chile con queso and sour cream. 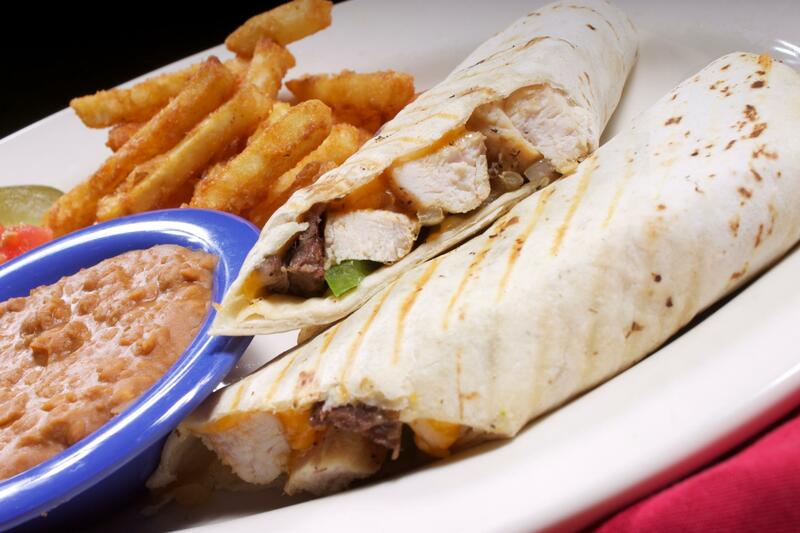 A grilled quesadilla wrap stuffed with chicken or beef fajita, grilled onions, grilled bell peppers and cheese. Served with your choice of beans, rice, or french fries, a pickle spear, and a side of sour cream. Brisket tacos with choice of corn or flour tortillas, topped with cabbage, avocado, radish and cheese. Served with white rice, papas, a garnish salad and a side of spicy salsa. A delicious mix of flavors. Grilled beef steak bites, onions & tomatoes inside three soft corn tortillas topped with avocado slices, cilantro & lime. Served with a small bowl of charro beans. Grilled tilapia tacos with choice of corn or flour tortillas, topped with cabbage, avocados, radishes, queso fresco & our own chipotle mayo. Served with rice and charro beans. Two soft beef or chicken fajita tacos, topped with lettuce, tomato, and cheese. Served with refried beans, diced potatoes, and a side of guacamole & sour cream. Crispy or soft tortillas filled with ground beef or shredded chicken topped with lettuce, tomato, and cheese. Served with beans and rice or papas. Juicy smoked pork mixed with sautéed onions served on your choice of corn or flour tortilla topped with our unique avocado cream salsa and a side of charro beans. Seasoned ground beef, cheese, lettuce, and tomatoes stuffed into a flour tortilla covered in your choice of queso sauce or red sauce, topped with melted cheese, guacamole and sour cream. Grilled beef steak bites or juicy brisket, onions, tomatoes, and cheese wrapped in flour tortilla. Served with an avocado salad, charro beans and a side of queso. A crisp fried burrito stuffed with your choice of chicken or beef fajita meat, onions, bell peppers, and cheese. Served with sides of queso, sour cream, guacamole and your choice of two sides. Choose from a ground beef, shredded chicken or shredded beef stuffed chimichanga, deep fried and topped with cheese and the sauce of your choice. Served with two sides. 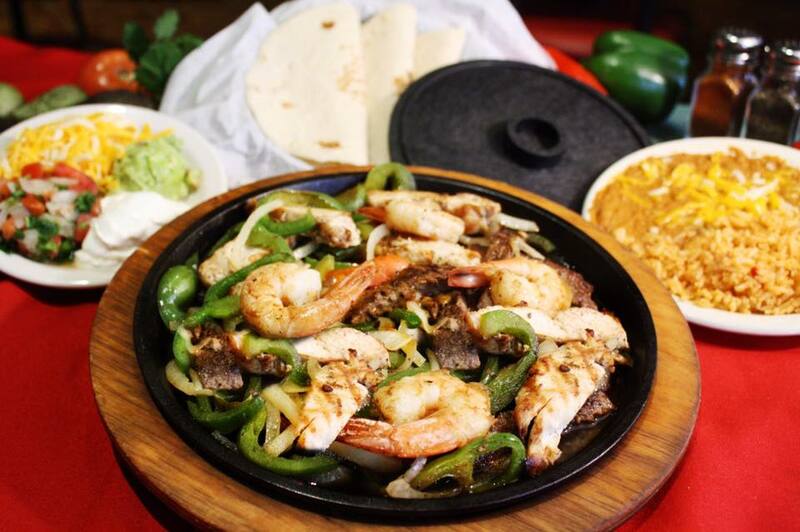 Our tender fajitas come with grilled onions and grilled bell peppers and are served with guacamole, pico de gallo, sour cream and cheese and your choice of two sides. Our unique vegetarian plate featuring sauteed portobello mushrooms, tomatoes, onions, bell peppers, zucchini & squash. Charbroiled chicken breast topped with seasoned mild green chiles and melted cheese. Served with a cheese enchilada and your choice of two sides. Charbroiled, chicken breast topped with sauteed onions, jalapenos, tomatoes & melted cheese. Served with a cheese enchilada and your choice of two sides. Tender stewed beef tips simmered in Mexican gravy. Served with a guacamole salad and your choice of two sides. Five beef or chicken taquitos topped with lettuce, tomatoes, avocado and drizzled in Mexican cream. Served with two sides. Fresh sopapilla stuffed with seasoned ground beef topped with chile con queso. Served with a small guacamole salad and your choice of two sides. Three fried eggs served on hot corn tortillas and smothered in our homemade tomato sauce. Slices of chicken or beef fajita meat on a bed of rice with grilled zucchini and squash & a small guacamole salad. A West Texas specialty. An Anaheim pepper coated with our crispy batter, stuffed with seasoned ground beef, chicken, cheese or avocado, deep fried until golden brown and served on top a bed of queso. Served with your choice of two sides. Chicken or beef bites sauteed in spicy green ranchero sauce topped with melted Monterrey jack and cheddar cheese. Served with a guacamole salad and your choice of two sides. A homemade chile relleno with your choice of ground beef or chicken, topped with homemade tomato sauce, melted cheese, sour cream, raisins, and chopped pecans. Served with a guacamole salad and your choice of two sides. Tender pork carnitas simmered in our homemade green chile tomatillo sauce. Served with a guacamole salad and your choice of two sides. Cheese relleno, avocado enchilada, cheese enchilada topped with red sauce. Served with a beef taco on the side. Two enchiladas of your choice, with the sauce of your choice and a crispy beef taco. Served with your choice of enchilada topped with the sauce of your choice and a beef or chicken taco. Small pieces of tender cooked pork in our homemade green chile sauce, served with one enchilada of your choice, and a guacamole salad. Tender stewed beef tips simmered in Mexican gravy, served with one enchilada of your choice and a guacamole salad. A roasted Poblano pepper stuffed with beef or chicken fajita meat, Mexican corn and cheese, topped with queso. Accompanied by a cheese enchilada with your choice of sauce and a guacamole salad. Chilled shrimp in a flavorful and refreshing tomato-juice cocktail mixed with pico de gallo, fresh cilantro and sliced avocados. Served with saltine crackers. Six bacon wrapped jumbo shrimp stuffed with cheese and bell pepper on a bed of white rice accompanied with sauteed veggies. Tilapia filet and 3 grilled jumbo shrimp topped with homemade tomato or homemade cream sauce and melted cheese served with white rice and sauteed vegetables. Spiral pasta topped with grilled shrimp, grilled zucchini, squash and corn, smothered in our homemade cream sauce, served with Texas toast. Grilled Norwegian pink salmon seasoned to perfection on a bed of white rice. Served with a side of mango salad and sauteed vegetables. A charbroiled hand-cut rib-eye steak cooked to your taste. Served with two American favorite sides. A charbroiled hand-cut rib-eye steak topped with seasoned mild green chilies & melted cheese served with one cheese enchilada, re-fried or charro beans, rice & a guacamole salad or an American salad. A charbroiled hand-cut rib-eye steak topped with sauteed onions, jalapenos, tomatoes & melted cheese. Served with one cheese enchilada, refried beans, diced potatoes & guacamole salad or an American salad. A charbroiled hand-cut rib-eye steak cooked to your taste. Smothered in our homemade tomato sauce. 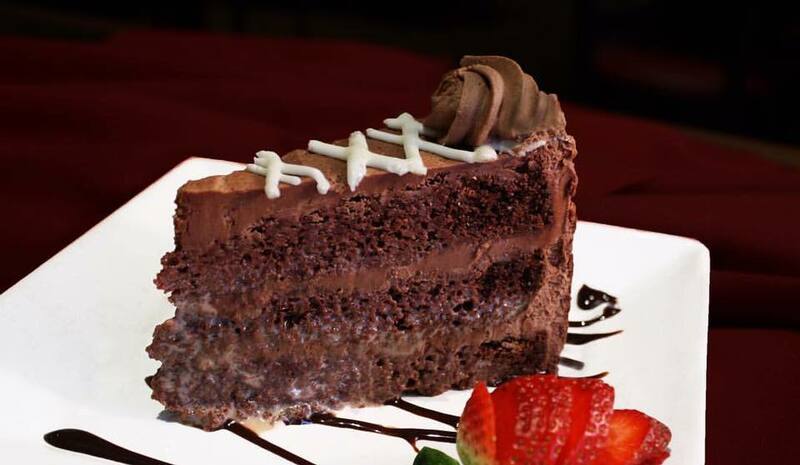 Served with refried beans, diced potatoes, a cheese enchilada & a guacamole salad or an American salad. 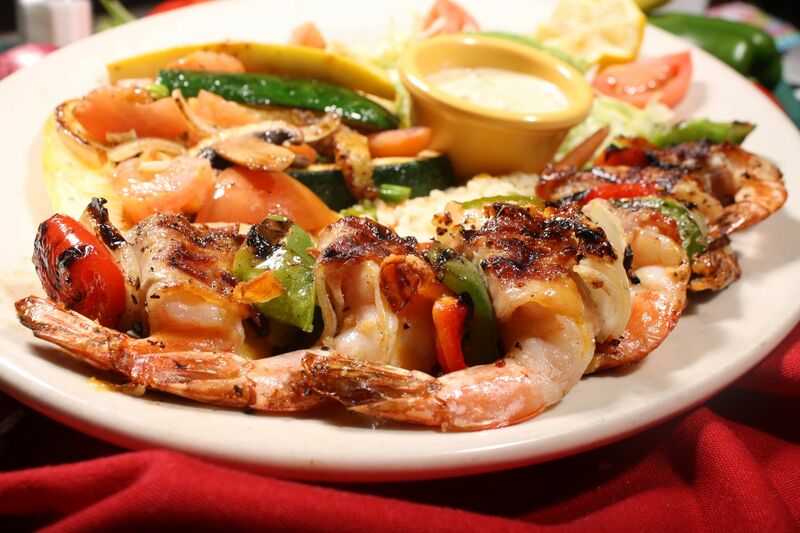 Two 3 oz bacon wrapped Black Angus beef tenderloins cooked to perfection accompanied by three jumbo shrimp brochette. Served with two American favorite sides. All Burgers served with lettuce, tomatoes, onions, pickles & french fries. 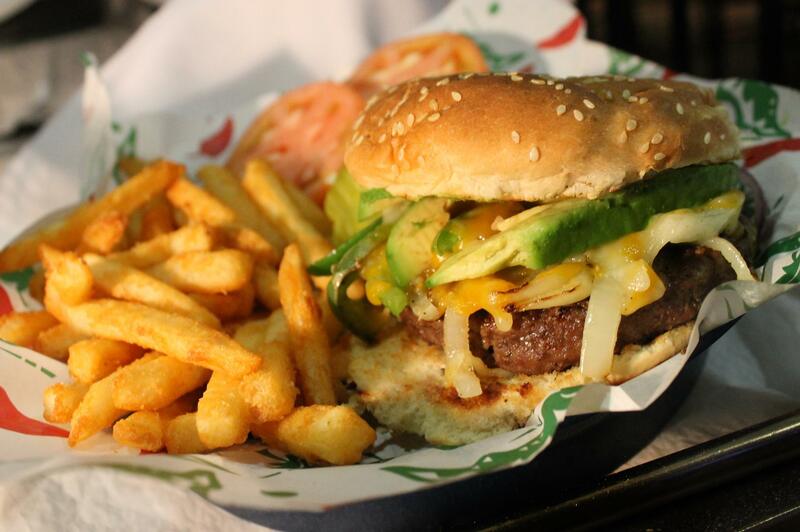 Half pound of fresh ground beef, with American cheese, topped with grilled onions, bell peppers and sliced avocado. Served with lettuce, tomatoes, onions, pickles & french fries. Half pound of fresh ground beef, charbroiled. Served with lettuce, tomatoes, onions, pickles & french fries. A marinated chicken breast served on top of a bed of white rice. Served with fresh pineapple. Grilled chicken breast covered with sauteed mushrooms, monterrey jack cheese & bacon strips. Large tenderized breaded beef steak deep fried, served with cream gravy. A half pound ground beef patty topped with sauteed onion, green chilies, mushrooms and melted cheese.